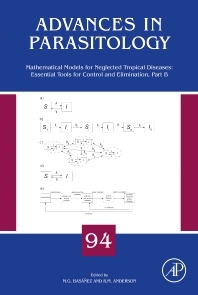 Mathematic Modelling: Improving the Implementation, Monitoring and Evaluation of Interventions, Part B, the latest volume in the Advances in Parasitology series contains comprehensive and up-to-date reviews in the field of mathematic modeling and its implementation within parasitology. The series includes medical studies of parasites of major influence, such as Plasmodium falciparum and trypanosomes, along with reviews of more traditional areas, such as zoology, taxonomy, and life history, all of which shape current thinking and applications. Professor Sir Roy Anderson is the Director of the London Centre for Neglected Tropical Disease Research and works at the Department of Infectious Disease Epidemiology, Imperial College London. Professor Maria-Gloria Basanez works at the Faculty of Medicine, School of Public Health at Imperial College London.